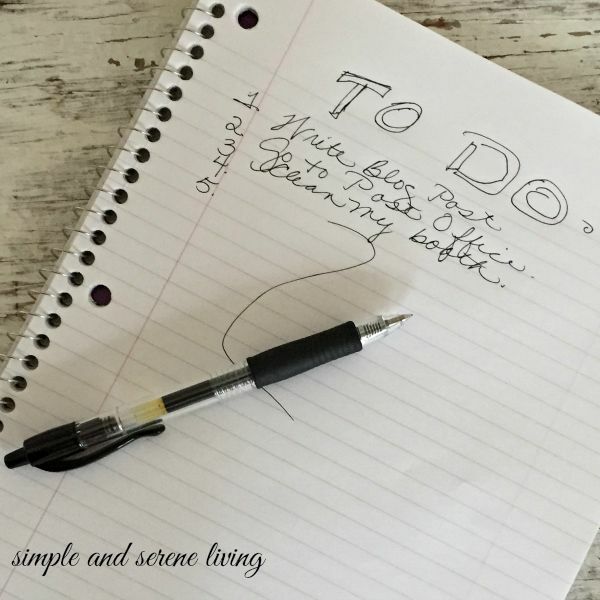 Do you have a TO DO list? I do and mine is so long at the moment that I almost feel frozen. I talk to my list and what I say usually isn't all that pleasant. It usually goes something like this. "Don't you realize that I am only one person. How can I possibly accomplish everything on here?" "Don't be ridiculous you stupid list, I can't do all of this." "This is so not fair." "GRRRR" I know I am starting to sound like my nine year old granddaughter, but let's face it, there are times that we feel like we just can't get everything done that we need to do. So how do we accomplish all that we need to do without stressing ourselves out. 1) Breathe, Relax, and Cut Yourself Some Slack We are all human and there is only so much any of us can do in a day. Even though we may start off our day with the best of intentions, at the end of the day we will probably find that we weren't able to accomplish all of the things that we set out to do. IT'S OKAY. 2) Prioritize Look at your list and decide what is most important for you to get done that day. Choose three things, and put those things at the top of your list. If you are able to get those three things done then pat yourself on the back and move onto the next most important thing on your list. If you don't get those done, and let's face it things come up, then go back to the cut yourself some slack. 4) Do A Happy Dance when you complete something on your list. Be proud of the fact that you accomplished one of your tasks. You are just so completely awesome. 5) Accept That You Will Never Get Everything Done You are only human and there is always going to be more things to add to that list. Once again, go back to cut yourself some slack. Life is too short to stress out over your TO DO list. You can't please everyone, so know that you are doing the absolute best that you can. How do you approach your TO DO list. I would love to hear your ideas. If I wrote a to-do list, I'd just lose it. I'm not a fan of lists but when I have a project or a bunch of stuff to get done---I do a very detailed step by step list that breaks down each task into multiple [parts. It's easier to manage. I like list, but I don't write the down. My smart phone has a task maker and use that for "thinking" of it now things that pop in my mind. i use Note pad on apple...so I guess I like list and they do help me stay focused! I always try to tackle one thing at a time. Otherwise, the long list is overwhelming! Good suggestions, Laura. I am like Susan ^^. If I say or write "clean the kitchen", I don't even know where to start. If I list all of the things I want accomplished when the outcome is a clean kitchen, it becomes do-able. So I list: counters, sink, stove, floor, inside refrigerator, outside refrigerator, paperwork/clutter, dust ~ and then I can see what I have done as I check things off, and what remains. I learned this when I used to tell our (then) little boy to "go clean your room", and I would find him sitting on the floor playing. He had no idea how to accomplish that rather vague request. We then sent him in to: clean off and make your bed.....then when he finished that we could ask him: to pick up everything on the floor near your bed and put it away. When told in bite size pieces it works much much better. Same for me!! Hi Laura. Oh Lordy, do I have a "to do" list? Uhhhh, yeah, several of them. Some things I get done and some I don't. I feel there is a reason I procrastinate (BIG TIME) on some of them. Perhaps they feel too daunting and I just don't know where to start. When I do complete a task on the list, I find great pleasure in writing a line through it in black thin-tipped marker. Some RARE days, I get to cross out everything but that doesn't happen too often. I do find, Laura, that writing down things that need doing helps tremendously. That simple act of putting items in marker on paper helps me to clarify and get things done. I make "to do" lists often. Usually it makes me feel better to jot things down so I don't have to keep them all in my head. it makes me feel more organized that way. However, it can also work against me and remind me of everything I need to do! (Ignorance is sometimes bliss.) I try to prioritize things too. It's hard when you're OCD like me and like to get it all checked off on the day you planned. I guess sometimes it's important to remind yourself that tomorrow is another day. Another day to whittle down that list!